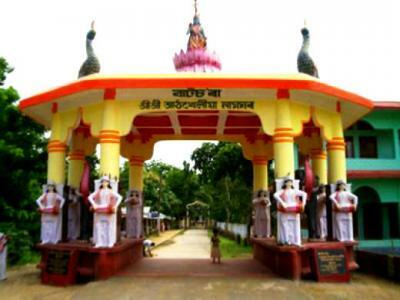 Situated at a distance of about 20 kms from Golaghat town the Athkhelia Namghar is constructed by the Ahom prince Gadapani, the husband of Sati Jaymoti around 1681 when he becomes the King of Ahom kingdom. For assamese peoples Athkhelia Namghar occupied a very important place in the hearts. History of Athkhelia Naamghar : Accroding to historians the period of 1670 to 1681 which was a crucial time for Ahom kingdom. At that time Ahom kingdom was ruled by Lora Roja. He in order to secure his position as a king of Ahom kingdom ordered to maim all Ahom prince of that time by making them physically disabled so that they cannot ascend the thrown. Gadapani one of the Ahom prince of that time in order to save himself from the clutch of Lora Roja, took shelter in Nagapahar. At that time he came across the ashram of a saint which was situated at the place where Athkhelia Namghar stands today. He took shelter at that place. There was a hermitage where the Naamghar is situated now. The place was full of wild animals. A few families that lived had to confront all odds, coping with the wilderness. Wandering in the jungles, Gadapani reached this hermitage and lived here for a long time in the hermit's love and care. When Lora Raja's soldiers were running after Godapani Konwar to capture him, immediately after he crossed that particular place, a thick cob-web had all-covered the road. When the soldier saw the flaw-less cob-web they thought that Godapani wouldn't have crossed the road and they went off in another way. In 1681 A D, Gadapani, known as Gadadhar Singha, ascended the throne of Ahom kingdom. He never forgot the care and love the hermit bestowed upon him during his hardship. He immediately set out in search of the hermit, but couldn't find him. The place was by then well populated. Gadadhar Singha ascribed the responsibilities of maintaining the hermitage to the eight families who lived there. In course of time these eight families constituted eight clans. Each clan was known as a 'kuri' or 'khel'. Unitedly they were called 'aathkuria', meaning eight clans. Later the term transformed into 'Athkhelia'. 1. Bochakuri : The clan, who were selected specially by the king for various services. 2. Bairagikuri : This clan was chosen to work as messengers of the king to other kingdoms or foreign countries. 3. Brahmankuri : Ahom Kings had brought and settled Brahmans from other parts of the country for religious purposes. This particular clan consisted of some of them, although non Brahmans too were included in this khel or kuri later. 4. Nangalkuri : 'Nangal' means plough in Assamese. Members of this clan were in charge of cultivating the land. 5. Solalkuri : Not certain, perhaps 'Solal', which means well versed/knowledgeable, was an intelligent person who could guide the villagers. In due course, his family or descendants formed Solalkuri. 6. Kacharikuri : Kachari was the name of a person by whose name this khel was formed. 7. Borahikuri : This khel was constituted of the Borahi tribe, who later converted to Vaishnava. 8. Kakatikuri : 'Kakati' was a title given by Ahom Kings to those who were engaged in keeping accounts of land and it's produce. This khel was formed by the Kakatis. As all types of religious activities were undertaken under the supervision of these eight khels this place was formerly known as Athkuria which is later on became famous as Athkhelia. Athkhelia Namghar is a very important pilgrimage centre for Assamese people. Regular worship and visits by people from far and wide soon turned this temple into a desired destination for pilgrimage. Devotees from all corners of Assam and India visit Athkhelia Namghar during the holy month of Bhada. Each kuri erected a thatched hut around this temple. Later the huts were renovated with posts of timber. Since then, in memory of the kuris, eight parts of offerings are made on their behalf, to Lord Vishnu, before the naam-kirtan (prayer) starts in the Naamghar everyday. From the year 1900 onward the Athkhelia Namghar Development Committee had been formed and in a systematic way this committee has been performing its many folded responsibilities till now. The list is quite a long with the permanent Namghar , electricity provision, guest house, rest room, concrete wall, gateway to the Namghar, new road, water supply, maintenance of the Namghar compound etc. 2) By Rail : Nearest railway station is Forkating Junction which is 12.8km. far. 3) By Air : Nearest airport is at Jorhat whic is around 60 km. away. Best time to Visit Athkhelia Naamghar: September to May and also during the festivals. Where to stay in Athkhelia Naamghar: There are lots of comfortable hotels in Golaghat town. For more details about Gloaghat click here.